January is Full of Changes! There are days when something happens that I think I should blog about. A lot of those days have gone by, and I don't have a clue what to say. Since I have a whole month to catch up on, I'll keep it quick. 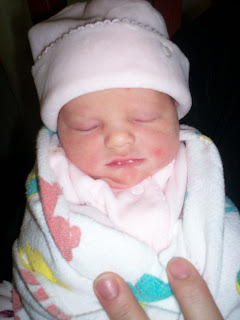 ♥On January 4th, 2008, the Cooley family was expanded by one. Addilyn Marie Cooley was born around 4pm in Boulder, Colorado, while I was somewhere in the middle of Wyoming, trying to get there before she arrived! ♥On January 22, I accepted a new offer for a full time job. Now I don't have to work two part-time jobs! Yay for no more waiting tables! I start next Monday, so we'll see how I like it. ♥I have been sick for about three weeks now. I am so done, it's not even funny. ♥It has snowed here at least every other day for the past month... I am just guessing, but that feels accurate. It snowed so much, that our snow tubing activity at Soldier Hollow was canceled. Argh! ♥I... Ummm.... Errrr..... I am in the *cough* Relief Society Presidency *cough*. Ummm.... yeah. I don't know exactly who was the brilliant one to think of me, but they must not have been aware of my unwillingness to get out of bed in the morning... or maybe they were, and this is their evil plan. ♥I have a new favorite movie- Juno. I saw it twice in the theater, and I have the soundtrack. It's an excellent film, and I highly recommend it. I mentioned that fact to one of my roommates (we'll just call her 'Dagron'), and she let me know how much she hated it, and said that she walked out of the theater because it was - and I quote - "vulgar and disgusting". Ha ha ha ha ha ha. Oh, Provo. ♥Oh, and my sister turned thirty, so everyone go and make fun of her now.